What is stronger than steel, tougher than Kevlar, and makes you flail when you walk through it? Cobwebs! 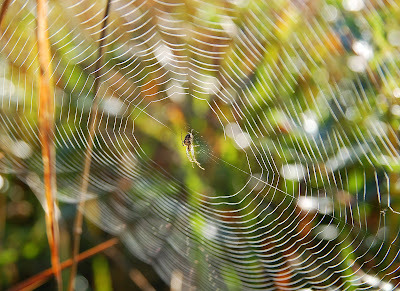 This Friday's post is all about how engineers, biologists, and materials scientists are spinning spider silk into biodegradable electronic devices that use silk instead of wire to transmit signals. Spiders and silkworms have glands that produce proteins of liquid silk. 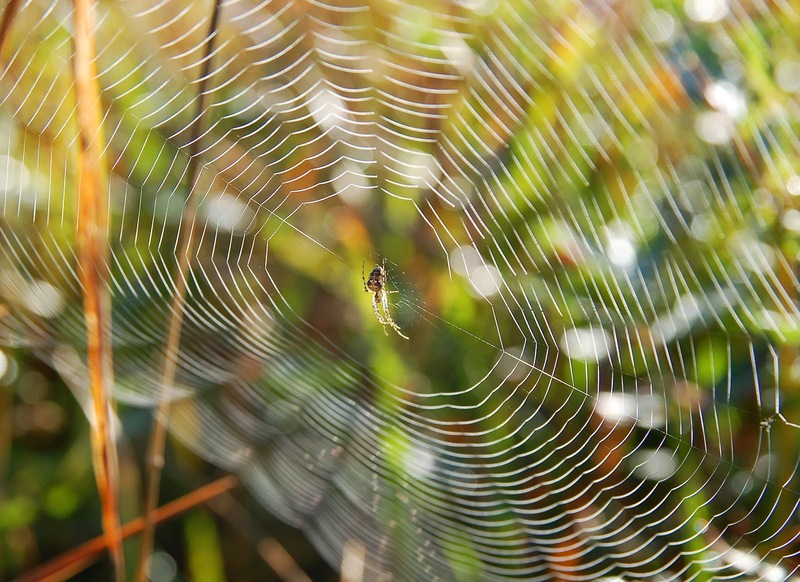 The silk becomes solid when a spider squeezes it out into sticky sinewy strands only five micrometers wide. Silk has greater tensile strength than steel, can be stretched many times its length before breaking, all while staying super flexible. On top of that, light can travel down a silk strand just like it does in glass, basically making it nature's own fiber-optic cable. Now, experiments by scientists like Fiorenzo Omenetto at Tufts University, John Rogers at the University of Illinois at Urbana-Champaign, and Nolwenn Huby at the CNRS Institute de Physique de Rennes propose that the optical and mechanical properties of silk could be key to the future of dissolving cameras, biodegradable biological implants, and environmentally friendly electronics. Huby and Omenetto presented their work this month at the Optical Society's annual meeting in Rochester, NY. Omenetto made a nanometer-thick heating circuit wrapped in silk. The components were made of minerals like magnesium that are already present in the body, and the crystalline structure of the silk was carefully crafted to dissolve in water within weeks. In a different device, the scientists could fabricate the silk threads to dissolve after years or in mere minutes. Omenetto and his colleagues implanted the heating device underneath a rat's skin to limit infections after surgery by locally increasing the temperature around the wound to kill bacteria. A similar device could be implanted and monitor the healing process. Once the wound healed, the silk device dissolved and was absorbed into the body. Three weeks after the surgery, almost all traces of the circuit had disappeared. Silk also has many potential imaging and sensor applications. Researchers in Huby's laboratory found that silk could be used as a fiber optic cable, transmit data in pulses of light and could be integrated into current silicon photonic chips. The ability to guide light through a silk wire could also enable future microscale biosensors and cameras. Researchers in Roger's and Omeretto's lab have already developed a 64-pixel digital camera, thermometer, and even solar cells-- all out of silk technologies. Open Season on Einstein's image? Planet Hunter calls to Crowdsource the Universe. Quark Twain Shoots Lasers and Writes About It.